Is it time to ban polystyrene? You’ve seen it in nearly every movie set in a New York winter – the movie’s main character bundled in a coat, clutching a cup of hot “kwa-fee” – in a polystyrene foam cup. However, as of 1 July 2015, a ban on single-use polystyrene foam food and beverage containers (take away containers, food trays, cups, bowls, plates and loose fill packaging nuts) came into effect in New York City. The City’s Mayor Bill de Blasio even declared that the material cannot be fully recycled with current infrastructure. Over 100 municipalities in 12 states including New York and California have now banned polystyrene foam with another seven municipalities considering it. So what does this mean for us? Should we continue to use polystyrene foam and focus on improved recycling, or make a clean break by banning it? Polystyrene is a plastic derived from crude oil. Polystyrene beads are steamed and expanded before being moulded into the required foam shape. Expanded polystyrene (EPS) mainly consists of air and is valued for its insulation and lightweight properties. However, these properties also make it problematic as litter and in landfill. It flakes easily; ends up in waterways and eventually in our oceans contributing to the “Pacific garbage patch” amongst other problems. In landfill it refuses to compact and takes up valuable air space. In 2010-11 the Australian economy consumed 41,651 tonnes of EPS. According to Expanded Polystyrene Australia, polystyrene foam is 100 per cent recyclable. However, there are only 1-2 EPS recycling sites, per state, listed on its website. In 2010-11 only 3504 tonnes were recycled, equating to an overall recycling rate of only 8.4 per cent. In 2011-2013, the Australian Packaging Covenant and the NSW EPA aimed to make headway on EPS recycling, to their credit, by providing $500,000 in grant funding across 19 organisations. The program recovered an additional 222 tonnes a year of EPS, increasing the overall recycling rate by just 0.5 per cent to 8.9 per cent. Put another way that cost $2252 a tonne recovered over one year. Ouch! Even if you depreciate the equipment over 10 years it is $225 a tonne a year, which is more expensive than most landfills in Australia. So even if the baling equipment is free, it is still cheaper in most of Australia to landfill EPS. How would we grow recycling? These enhancements would involve big costs, for a material that represents 0.2 per cent of the waste stream in Australia. Would a ban negatively impact Australian businesses and the economy? While the future for the small number of Australian EPS manufacturers would be bleak in the face of a ban, other Australian businesses will adapt by using other packaging materials which are not only “recyclable”, but actually recycled. This is what is happening in the US. There are plenty of alternatives to EPS. 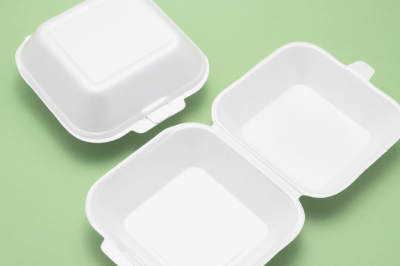 It has been over 20 years since McDonald’s ceased the use of EPS clamshell containers, with no major harm caused to the company’s brand or bottom line. Dunkin’ Donuts, for example, has switched to polypropylene cups (plastic #5) in New York City where this material is accepted in municipal recycling programs. The effect on the economy would be minimal. Substitution is relatively simple. The challenge would be limiting imports of materials containing EPS packaging. The Sony TV would need to be packaged differently at source. This would require federal and state government cooperation – not easy in the current political environment and EPS is not high on the environmental priority list of governments. But what we must do is start a strategic conversation about options and costs relating to EPS (before we spend scarce hard earned taxpayer’s money subsidising collection). While I strongly support the NSW government’s efforts to trial EPS recovery grants and infrastructure, the fact is governments can’t and won’t subsidise recovery over the long term. The private sector is unlikely to step up its recovery effort without regulation or price signals (which must maintain a level playing field). Consumers don’t have many options right now and require clarity. I think the options speak for themselves, but I look forward to your thoughts. Mike Ritchie is director at MRA Consulting Group. What about the building industry’s use of EPS for insulated walls and the like? I’ve heard claims that using EPS is ‘environmentally friendly’ because of its insulating properties. What about bean bags, which have had a designer resurgence recently? I remember scooping the family cocker spaniel’s EPS-peppered-poop as a youngster — that’s how we knew the bean bags needed re-stitching! Oh, and surfboards… Now more popular than ever before across a wider section of our community than ever before. Shapers have next to no alternative for their blanks, as much as I’d like to see that change. I even knew a sculpture student 20 or so years ago who used EPS as the structure around which he moulded clay. Before firing his pieces, he would use the spray nozzle of an air compressor to inject methylated spirits, if I remember correctly, to ‘melt’ the internal EPS into what looked like the toxic remains of cartoons in Who Framed Roger Rabbit (‘the dip’). EPS has always been insidious once obsolete, and there are so many alternatives to it for its main uses, but I wonder if enough people and politicians care to see its end.